She sailed over the sea…um…bridge to Skye… Scotland Day 3 | Great Scot! After a short night’s rest, I awoke to a misty moist Scottish morning in Oban. After repacking my bags, I headed next door to the breakfast room at the Hawthorne Bank Guest House. There are advantages to having a ground floor room. I sipped my tea and enjoyed every bite of my scrambled eggs with smoked Scottish salmon. Hunger satisfied, I loaded my bags in the car and took a few photos of the view from the front garden of the Hawthorne Bank. I also couldn’t resist taking a photo of the cunning little boot scraper built into the outside wall of the house. Once again on the road, I made my way towards Fort William and then Mallaig to catch the ferry to Skye. On the way, I was reminded some things are the same the world over and road construction delays are definitely one. (I’m not complaining though. These roads are so much better than what I remember from Ireland.) As I made the turn on to the A830, I encountered a little wrinkle in my plans for the day. A huge flashing sign said that ferry service from Mallaig to Skye was ‘disrupted.’ I was pretty sure this wasn’t good and decided to be safe rather than sorry and made a quick call to Susan. She, bless her heart, called the Ferry company and found out that chances were pretty good that the ferry I was planning to take would be cancelled due to winds. Rather than take the chance, she quickly reconfigured my route to take me to Skye via the bridge at Kyle of Lochalsh. On the positive side, this reroute allowed me to take in some other sites I would have otherwise missed. Per Susan’s excellent advice, I stopped at the Commando Memorial outside of Fort William (accompanied by two coach loads of other tourists) to take pictures of the stunning views of Ben Nevis and the other peaks in the distance. I also was able to relive some of the memories of my previous trip to Scotland, when my Mom and I took a coach tour of the Highlands, as I passed through Spean Bridge and saw the little hotel where we had lunch. I continued up past Invergarry, stopping frequently to take photos. Every bend in the road brought a new fantastic view. I continued to dodge raindrops, jumping out to take quick bursts of shots. It was during this leg of the journey that today’s theme emerged. From yesterday’s rainbows, I had moved on to waterfalls. Everywhere I looked, water was falling from mountains and crags. Some were little trickles and some were rushing torrents. One of the first but not last waterfalls of the day. By this time, my scrambled egg breakfast had worn off, so I was delighted to see Eilean Donan Castle come into view. I was quite sure I could find a tasty lunch in the Castle tea room and boy I was not disappointed. I had a Cheese and Onion pie with a side salad, tea and a scone. (Yes, Marisa, I finally had my first scone of the trip!). Fortified by the lunch, I set out to tour the Castle. As lovely as it is, it’s important to note that Eilean Donan was rebuilt on the ruins of the earlier castle that was destroyed in the 1719 Jacobite uprising. The rebuilt castle wasn’t completed until the 1930’s. Still, there was a lot to see. I also captured some lovely photos of Loch Duich. I was just able to beat the rain back to the car. If you look closely in some of the photos, you can see the rain coming down the loch. Something wet this way comes! After Eilean Donan, my next destination waypoint was the bridge at Kyle of Lochalsh over to Skye. I had planned to record myself singing Bear McCreary’s version of The Skye Boat Song on the ferry trip over, but since that was scuppered due to weather, I had to content myself with singing it as I crossed the bridge. And now, I know you guys aren’t going to believe this, but literally the moment I sang the line ‘mountains of rain and sun’, the sun (which I had not seen all day) suddenly broke through a wee hole in the clouds and shined through the rain against the mountains of Skye. I swear to you, I am NOT making this up. I’m just chalking that one up to another amazing coincidence on this trip. There continued to be even more breathtaking views around every curve (of which there were many) as I drove along towards Portree, my destination for the evening. One of the most fantastic views was that of a great rushing torrent of water down the hills into the river on its way to the sea. I braved considerable wind to capture some pictures. I also have a video, but I’m not sure the internet here is up to uploading it in a timely fashion. I’ll share it on the GreatScot Facebook page. I pulled into the parking spot for my two nights on Skye about 4 pm. Rather than cram something into the short time before dark, I took the opportunity to unpack (after carrying my bag up 3 flights of steps) and catch up on social media a bit. I have to say that not having internet much, if any, during the day is not turning out to be that big a problem. Those of you, and you know who you are, that are laughing hysterically right now, STOP IT! I can be without internet for hours at a time and NOTHING BAD happens to me. 😉 A bit later, I popped into the restaurant a couple of doors down and had a tasty dinner of langoustines and scallops over salad. Normally I maintain a policy of not eating food that looks back at me, but I’m glad I made an exception. It was scrumptious. I’ll leave you tonight with a picture of the view out my window. 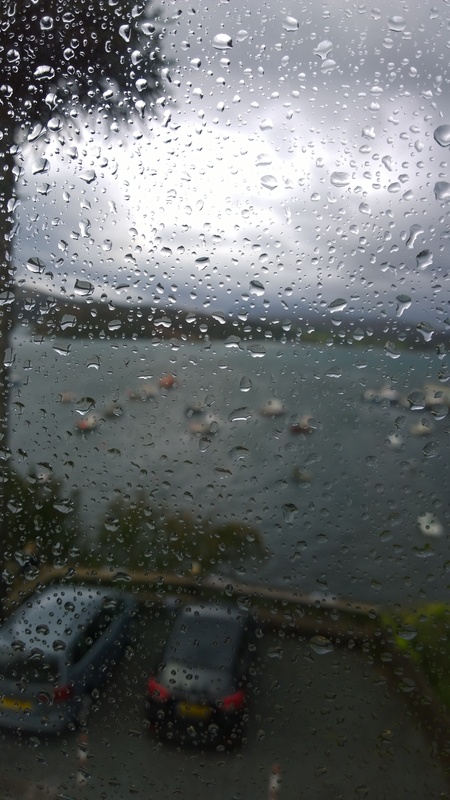 It’s hard to tell for the raindrops on the window, but there is a harbour out there with boats bobbing up and down like corks. Plans for tomorrow are up in the air due to weather. Forecasts call for 70+ mile an hour winds. Hoping to explore more of Skye and see Sabhal Mòr Ostaig (The Gaelic College), the Fairy Glen and the Fairy Pools. Hope I don’t blow away! Hope your upcoming days develop some calmer weather. Still, I know you will have a great time no matter what! I truly enjoyed this post and photos. Your description of the traffic, weather, and stairs was particularly memorable since I have experienced the same situations during my last visit to Scotland for the Gathering too long ago! I am laughing as I type this. Thank you for sharing your trip with us. Enjoy your time in Skye. The fish and chips are great — I wish I could remember the restaurant where we had them — it was right in the center on the main street in town. Maryann, who is lost without another episode of Outlander to see until April 2015! Mandy, I am hugely enjoying this — as obviously YOU are!!! Tapadh leat! Great to read! The town I grew up in actually was sister cities with Oban. You have taken some beautiful pictures. Thanks for sharing your experiences.